The word "osteoporosis" is made up of two parts: "osteo" relating to the bones and "-porosis" relating to the porous quality of the bone. Those suffering from osteoporosis are suffering from bone quality that is too porous in nature, meaning that the bone has too many pores. When it becomes too porous, it becomes less dense. The lack of density makes the bones brittle and susceptible to fractures. Most everyone knows that this is a relatively common disease in elderly persons and post-menopausal women. What they don't know is that people can develop stage 1 of osteoporosis as early as their 30s (source: Stop Osteo-arthritis Now! by Dr. Harris H. Mcllwain). Stage 1 is when the bone breaks down at the same rate at which it is built. The vast majority are unaware that they are in stage 1 because there are no symptoms. Stage 1 occurs around age 30 to 35, when the breakdown of bone occurs at the same rate the body builds bone. It has no visible symptoms. Stage 2 occurs usually after age 35, when the breakdown of bone happens at a faster pace than the body builds bone. It also has no visible symptoms, but it can be detected through bone-density tests. Stage 3 occurs usually after ages 45 to 55. During this stage, bones become so thin that they break from stress that they normally could withstand. Most cases of osteoporosis are diagnosed during this stage. Stage 4 occurs as bone fractures continue, pain increases, and disability appears. Deformities in the spine and other areas may become more obvious. There may be difficulty moving and doing daily activities. Fortunately, this stage is becoming less common because of the treatment available to prevent future fractures. Bone is most dense in our 20s. This is when we hit peak bone density (source: International Osteoporosis Foundation, iofbonehealth.org). In order to avoid the loss of bone density after this point, we should make sure to eat a nutritious diet, moderate our alcohol and caffeine intake and participate in progressive resistance training. The best kind of progressive resistance training is strength training and the safest form of strength training is the kind of training we offer at The Strength Studio: Power of 10. The majority of scientific studies have proven a positive correlation between strength training and increased bone density (source: http://www.ncbi.nlm.nih.gov/pubmed/9927006). Even if you have already been diagnosed with osteopenia (bone weakening, stage 2) or osteoporosis, you have a high probability of reversing your condition through strength training. The method of strength training that we practice at The Strength Studio was founded by Ken Hutchins under the name SuperSlow™ in the 1980s. In 1982 he led a team of researchers at The University of Florida in a medical study on osteoporosis. The study was funded by the Nautilus company, a manufacturer of weight machines. The study was called the Nautilus Osteoporosis Project. Researchers sought to prove whether strength training could reverse osteoporosis in patients with severe cases. What they found was that the traditional method of strength training (lower weight, higher repetitions) was dangerous to patients with such brittle bones. The velocity patients exerted increased the force which significantly increased the risk of injury. His solution: slow down the velocity to reduce the force and increase the weight enough to stimulate the growth hormone. Not only did the risk of injury go way down but patients also increased their bone density more significantly. From there, Hutchins developed the other tenants of the protocol to increase the safety of the exercise even more. Those tenants include applying meaningful resistance, proper alignment, proper breathing, using retrofitted machines and having a dedicated instructor guiding the exercise. The result: complete osteoporosis reversal. Hutchins found that in addition to reversing osteoporosis, trial patients also enjoyed other added benefits such as lower blood pressure, lower cholesterol and weight loss just to name a few. Several years later, Dr. Doug McGuff became a proponent of the protocol, becoming an instructor and spreading the word through books and informational videos. How exactly does strength training build bone density? Bone is a complex tissue that provides lifelong structural support for muscles, protection of vital organs, and stores calcium, which is essential for bone density (Neiman, 1998). All living bones are in a constant stage of breaking down and building up, referred to as remodeling. Specific chemical signals direct some bones cells, referred to as osteoclasts, to break down and remove bone (referred to as bone resorption, which means the act of absorbing). 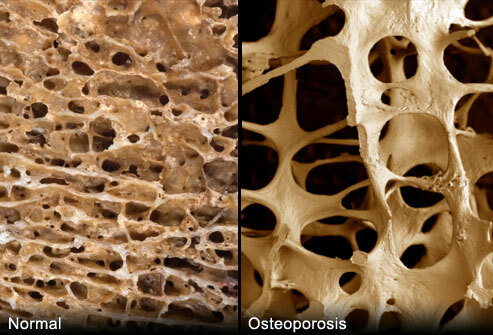 Different chemical messages tell other bone cells, know as osteoblasts, to deposit new bone. Shortly after puberty, bone mineral density reaches its peak (Robergs & Roberts, 1997). The process of remodeling is regulated by a variety of factors, including physical stress and a multiple-hormone system (Robergs & Roberts, 1997). One of the best methods to maintain current bone mineral density is through physical activity. Activity increases the physical stresses on bone. These stresses help activate the osteoblasts and favor bone deposition (Robergs & Roberts, 1997). Resistance training is one such physical activity that is increasingly being advocated as a means of retaining and even possibly increasing bone mineral density. Scientific research points to the fact that resistance training stimulates the osteoblasts to deposit new bone. However, in order to continue to build bone density, the resistance training must be progressively more difficult. In standard physical activity, once the body has adapted to the activity or exercise, it must become more difficult in order to stimulate growth. Most people mistakingly achieve this by increasing the intensity primarily through extending the duration of exercise (e.g. running longer, biking longer, longer cross training workouts, etc). Increasing the intensity by extending the duration can pose a higher risk of injury due to the repetition of movement. The other way people increase intensity through standard exercise is through sprints. However, this too poses a high risk of injury in the event that the muscle is not strong enough to support a sudden spike in velocity. ​This is why our method of strength training in the Power of 10 protocol is so efficient and effective. Rather than extend the duration or add explosive movement, this method of strength training applies incremental weight as strength is gained all while continuing slow and steady movement.